Rock On! 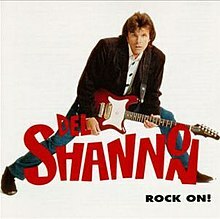 is the 12th studio album by American rock singer Del Shannon, released posthumously in 1991. Shannon returned to the studio after a long hiatus, collaborating with Jeff Lynne of the Electric Light Orchestra, Mike Campbell, Tom Petty, other members of Tom Petty and the Heartbreakers, and Richard Greene. Shannon committed suicide on February 8, 1990, and the album was completed for release on October 1, 1991. All tracks written by Del Shannon, except where noted. This page was last edited on 8 March 2019, at 17:48 (UTC).